It was great to get out this weekend and speak in support of animal rights. The Greens have strong policy position that the sentient animals we share this planet with should be treated as something far greater than property. On Saturday 14 March 2015 David spoke at the Global March for Lions, from NSW Parliament House to Sydney Town Hall. 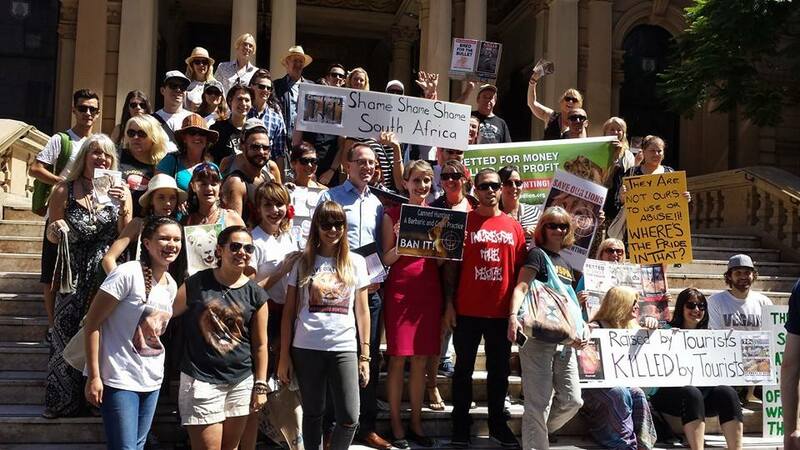 Sydney joined cities from around the world, including USA, UK, South Africa and India, marching to raise awareness of the plight of South Africa’s lions and to shed light on the “canned lion” hunting industry. Canned hunting is both cruel and barbaric, the idea that animals are literally bred to for slaughter, with hunters not even attempting any justification for their practice. Approximately 1,000 lions are canned hunted annually in South Africa – about 3 per day. Media: Victory for lions as Australia announces ban on bringing animal trophies into country – Herald Sun. Thank you to Barbara Krause for the photos. On Sunday 15 March 2015, David spoke at Sydney Pig Save, on the NSW Greens’ proposed Bill to ban farrowing crates and sow stalls by 2018. Too many animals in factory farming live in terrible and cruel conditions. Pregnant female pigs are kept for up to 16 weeks in a sow stall barely large enough for a fully grown female pig to take a single step forward or backward, and they are unable to move sideways at all. The Greens NSW have sought to enact a comprehensive factory farming bill with a two year phase out period to ban de-beaking and battery cage for chickens and ban sow stalls and farrowing crates. Thanks to Lauren Walden for the photos.